According to the Nation Credit Regulator, just under half of all credit active consumers in South Africa have impaired credit records, some with more than one debt obligation in arrears. Millions of consumers are struggling to fully meet their month to month debt obligations. As most companies pay-out bonuses to their employees at the end of February, which marks the end of the financial year, if you find yourself falling behind with your debt repayments it would be wise to use your bonus to settle some of your debt. Struggling to pay off your debt can lead to over-indebtedness and even worse, defaulting! It is important that you prioritise your debt repayments in order to free up cash in your budget and take a systematic approach to becoming debt free! 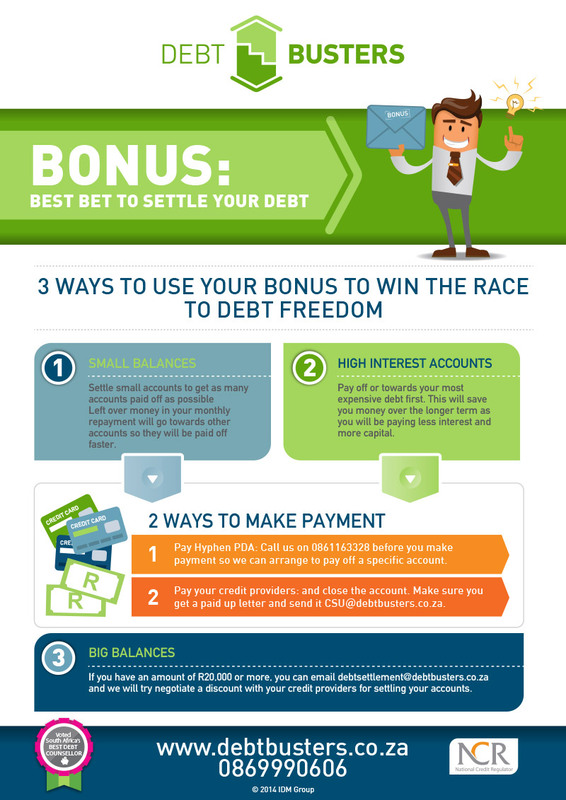 Follow these debt settlement steps! When going about settling your debt, it is vital that you look at settling accounts with small balances first. Settle your small accounts to get as many accounts paid off as possible. The left over money in your monthly repayment should then be allocated towards other accounts, so that you can pay them off faster. When using your bonus to settle debt, look at your debt profile to determine how much debt you have outstanding and how much you need to allocate towards paying off your debt. Credit obligations, mainly short term credit and maxed out credit cards, are usually the most expensive types of debt. It is advised that you pay off your most expensive debt first, as it will save you money over the longer term, as you will be paying less interest and more capital. Most South Africans are over indebted because they look to alleviate their cash constrained budgets by “borrowing from Peter to pay Paul” using short-term credit known as a ‘payday loan’. For example, many consumers borrow small amounts such as R8000 to use to pay for living expenses after spending all income servicing debt obligations. The reality is that you will end up paying back R12000 within a 6 month period. Settling short term debt with a bonus will help doing away with expensive debt and will provide long-term relief. Debt which is now in arrears should be prioritised as credit providers’ charge penalty fees and interest on accounts in arrears. 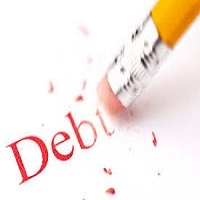 Settling debt in arrears can save you a lot of money and will also improve your credit score, since you would have saved yourself from going deep into arrears to the point of defaulting. The more one’s accounts goes into arrears, the greater the impact on your credit score, which would restrict granting of credit in the future as this is one of the most important aspects checked before a credit provider can extend a loan to someone seeking a loan. 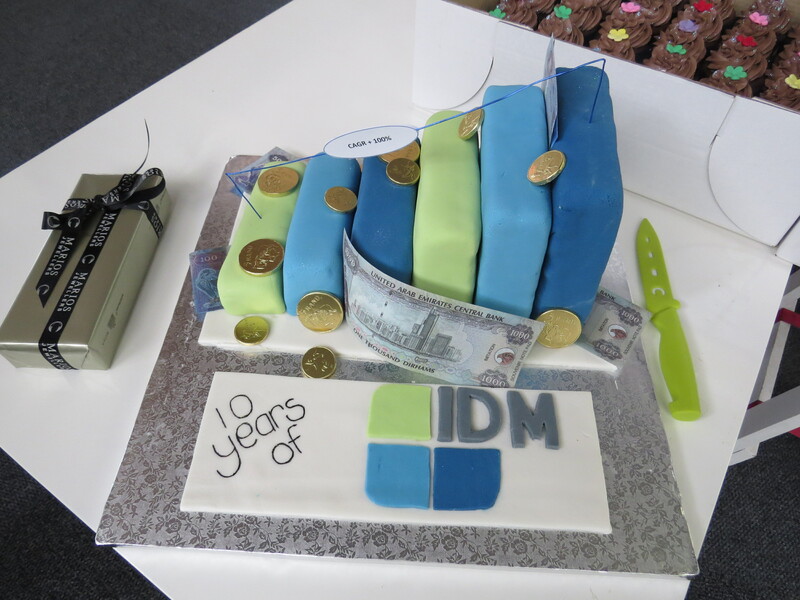 Most companies’ no longer pay out hefty bonuses thus it is advisable to make the most use of that which you have. The impaired credit records facing many South Africans today can be attributed to budget constraints in balancing expenses and income. Most of the times it is caused by one or more big debt instalments. For example a balance of R50000 expected to be paid up in 30 to 45 months, will require a monthly debt instalment of around R2000-R3000. Settling big debts using your bonus would free up R2000-R3000 from your budget, creating a bit of breathing room. When credit providers can sense that consumers may not be able to pay back their debt, they would rather offer discounts loans by offering an attractive settlement amount, which you are able to cover with your bonus. This benefits both parties as the credit providers’ cut down on estimated losses and the consumer ends up paying their debt without defaulting. It goes without saying credit providers are more than willing to help in settling debt for consumers with cash constrained budgets. 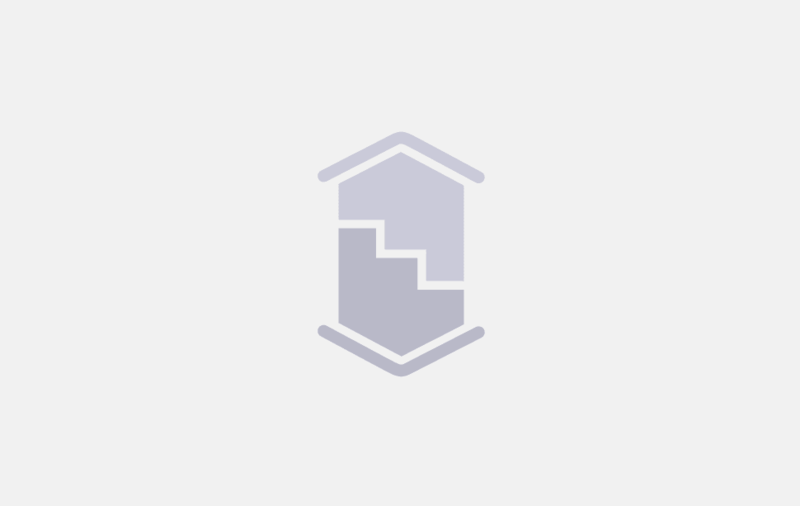 Debtbusters, the award winning Debt Management Company, also has a Debt Settlement department set up to help its clients with negotiating on settlement discounts with credit providers to ensure that consumers can make good use of their bonuses and settle debt saving a lot of money in the process. The 2015 Budget Speech and HOW IT WILL AFFECT YOU!